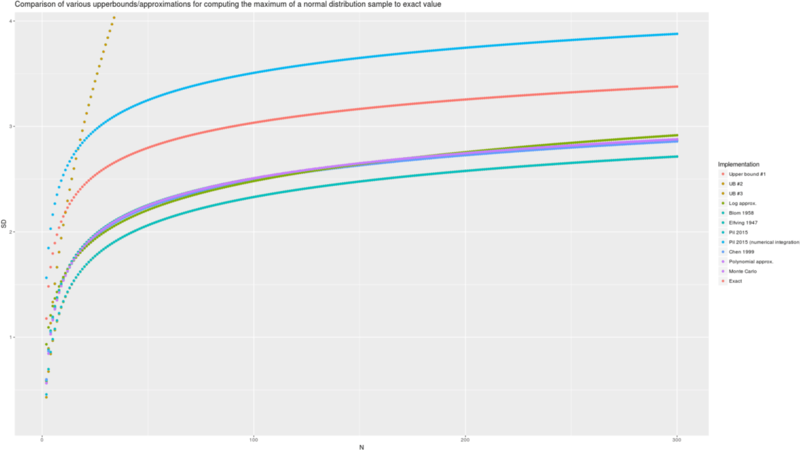 In generating a sample of n datapoints drawn from a normal/Gaussian distribution, how big on average the biggest datapoint is will depend on how large n is. 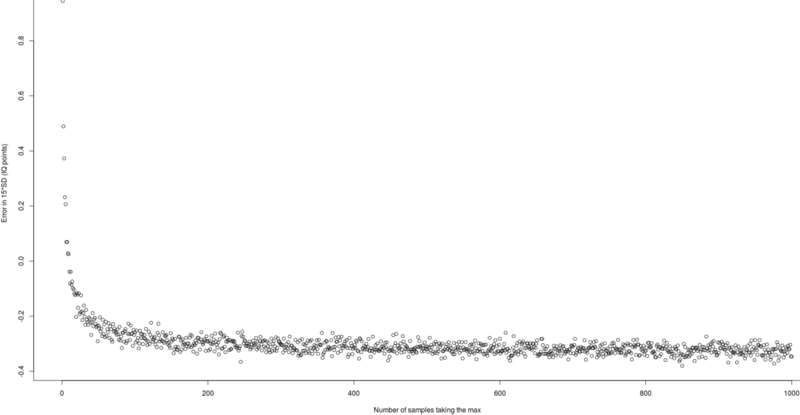 I implement in the R programming language & compare some of the approaches to estimate how big on average. In generating a sample of n datapoints drawn from a normal/Gaussian distribution with a particular mean/SD, how big on average the biggest datapoint is will depend on how large n is. Knowing this average is useful in a number of areas like sports or breeding or manufacturing, as it defines how bad/good the worst/best datapoint will be (eg the score of the winner in a multi-player game). 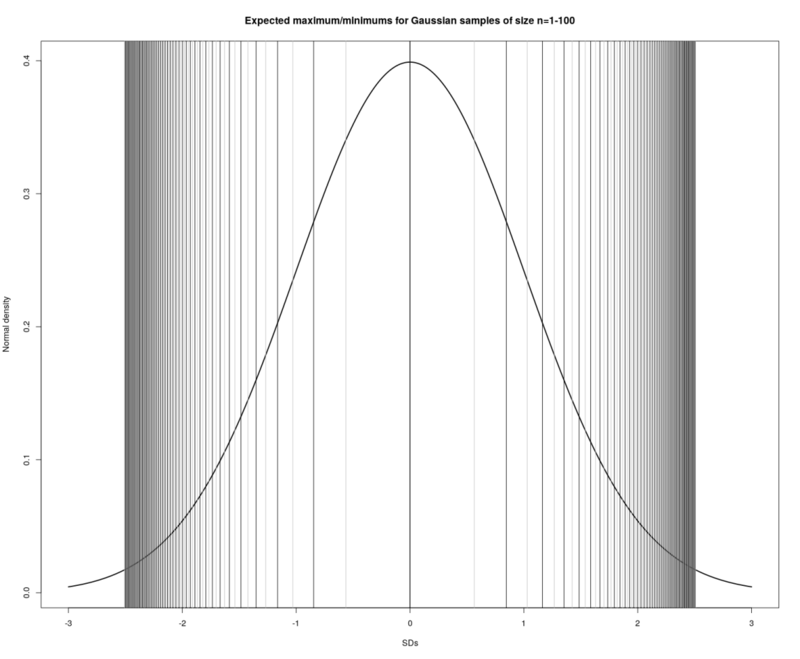 The order statistic of the mean/average/expectation of the maximum of a draw of n samples from a normal distribution has no exact formula, unfortunately, and is generally not built into any programming language’s libraries. I implement & compare some of the approaches to estimating this order statistic in the R programming language, for both the maximum and the general order statistic. The overall best approach is to calculate the exact order statistics for the n range of interest using numerical integration via lmomco and cache them in a lookup table, rescaling the mean/SD as necessary for arbitrary normal distributions; next best is a polynomial regression approximation; finally, the Elfving correction to the Blom 1958 approximation is fast, easily implemented, and accurate for reasonably large n such as n>100. 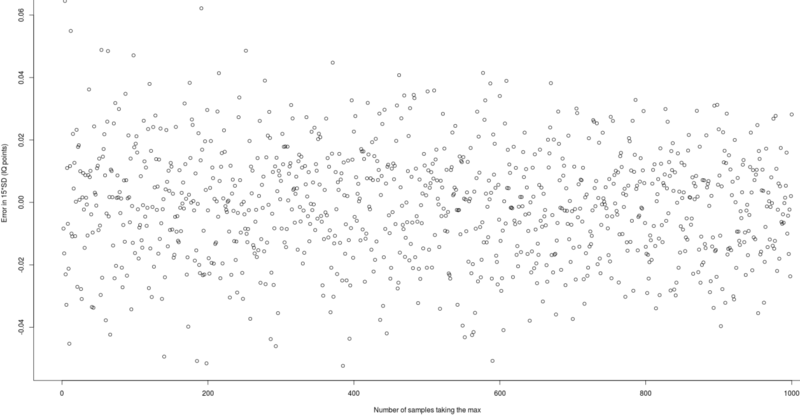 Visualizing maxima/minima in order statistics with increasing n in each sample (1-100). We can treat the simulation estimates as exact and use memoization such as provided by the R package memoise to cache results & never recompute them, but it will still be slow on the first calculation. So it would be good to have either an exact algorithm or an accurate approximation: for one of analyses, I want accuracy to ±0.0006 SDs, which requires large Monte Carlo samples. Harter 1961 elaborated this by giving different values for α, and Royston 1982 provides computer algorithms; I have not attempted to provide an R implementation of these. #       Min. 1st Qu. Median       Mean    3rd Qu. Max. From a less mathematical perspective, any regression or machine learning model could be used to try to develop a cheap but highly accurate approximation by simply predicting the extreme from the relevant range of n=2-300 - the goal being less to make good predictions out of sample than to overfit as much as possible in-sample. So this method, while lacking any kind of mathematical pedigree or derivation, provides the best approximation so far. # ...         Min. 1st Qu. Median          Mean       3rd Qu. Max. Comparison of estimates of the maximum for n=2-300 for 12 methods, showing Chen 1999/polynomial approximation/Monte Carlo/lmomco are the most accurate and Blom 1958/upper bounds highly-inaccurate. The memoised function has three arguments, so memoising on the fly would seem to be the best one could do, since one cannot precompute all possible combinations of the n/mean/SD. But actually, we only need to compute the results for various n! This gives us exact computation at O(1) (with an amortized O(1) when n>200) with an extremely small constant factor (a conditional, vector index, multiplication, and addition, which is overall ~10x faster than a memoised lookup), giving us all our desiderata simultaneously & resolving the problem. One might also be interested in computing the general order statistic. ## the default value of inc = 0.025. You may want to make the value of 'inc' less than 0.025. By default, alpha = 38 = 0.375. This approximation is quite accurate. For example, for n>2, the approximation is accurate to the first decimal place, and for n>9 it is accurate to the second decimal place. This approximation is quite accurate. For example, for n≥2, the approximation is accurate to the first decimal place, and for n≥9 it is accurate to the second decimal place.